Today I'm sharing an ocean-exploration themed guest tutorial from Alicia & Patrick of Felt With Love Designs - a free pattern for making your own felt squid, hammerhead shark, walrus, deep sea angler and submarine finger puppets. 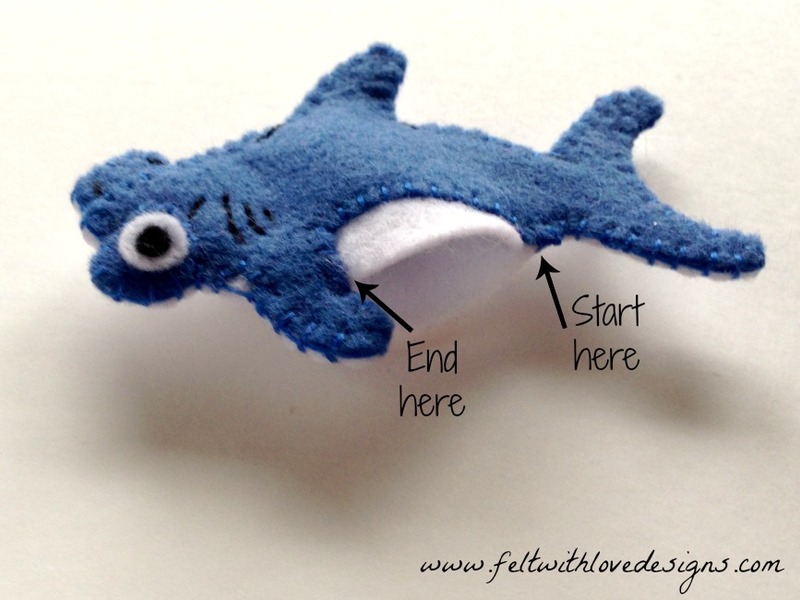 When you've made these, head over to their site to download the patterns for making more felt ocean creatures: a pelican, manta ray, seahorse, lobster and eel! These finger puppets were a blast to create! 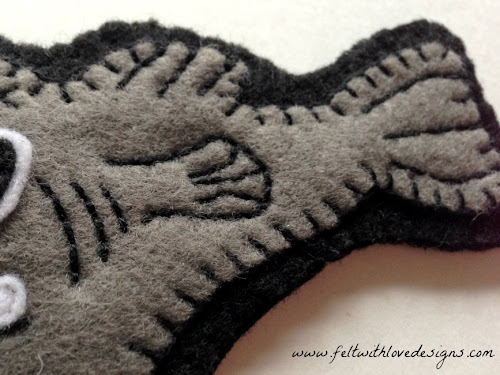 Quiet books started my love of sewing with felt but the more we design, the more I love the smaller details in finger puppets. 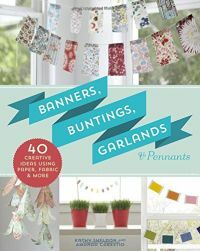 They also have the added bonus of a quick little project, giving you the instant satisfaction of completing something. Finger puppets are fun for little fingers to play with. 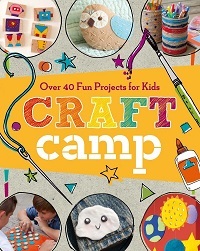 They encourage story telling and creativity. 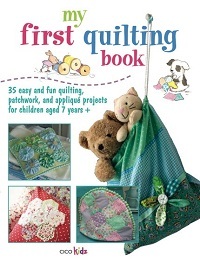 They also make excellent busy bags - throw a set into a pouch and stick them in your purse for instant fun while waiting at a doctor's appointment or for a long car trip! 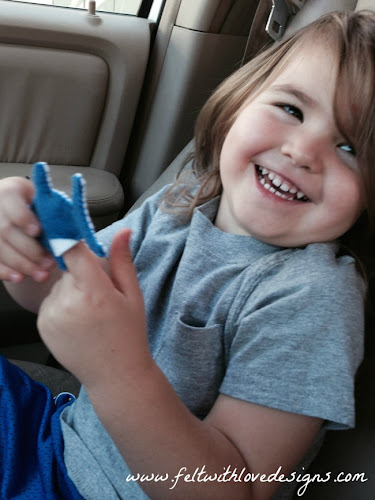 Our daughter loves playing with her sets of finger puppets in the car and while we sit in the bleachers and watch her brother's basketball games. 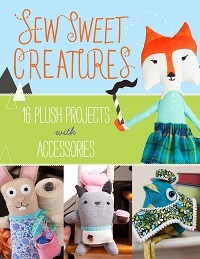 - Felt (colors stated below, with each puppet). - Thread to match felt. 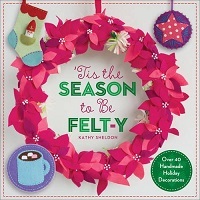 Felt colors: dark pink, bright blue, black, and white. 1. 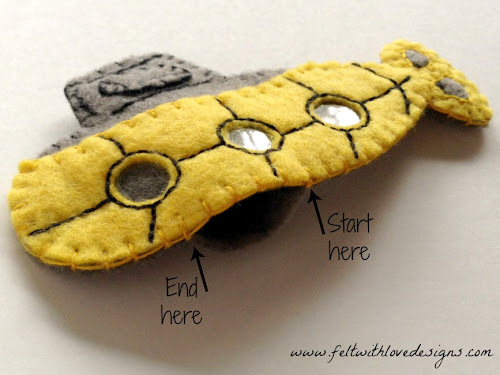 Cut all the pieces from felt. 2. 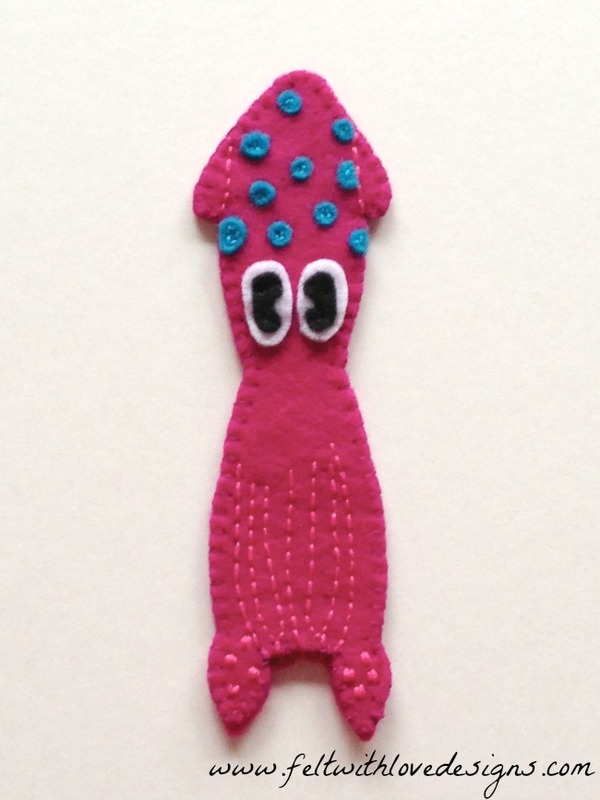 Position the eyes onto the squid body front and stitch down using black thread. 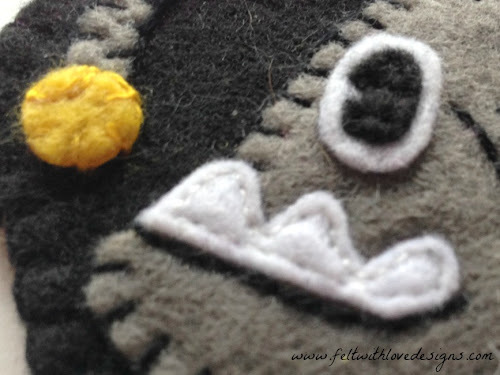 When creating eyes I place the white portion, place the black over the white, and stitch the black through the white. Not stitching the white separately makes the eyes pop a bit more. 3. Stitch blue spots onto the head, above the eyes, in a random pattern. I used a couple of short stitches in the center of each spot. 4. Using light pink thread, stitch lines on either side of the head, lines for the tentacles, and spots onto the large tentacles. 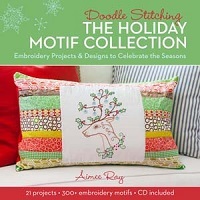 I stitched these free-hand but have but included the lines on the pattern pieces so you can trace them if you want. 5. Match up the squid body front and back and stitch them together using a blanket stitch, leaving the bottom open. I also go back and stitch just the front edge of the opening with a blanket stitch to reinforce it but that is totally optional. 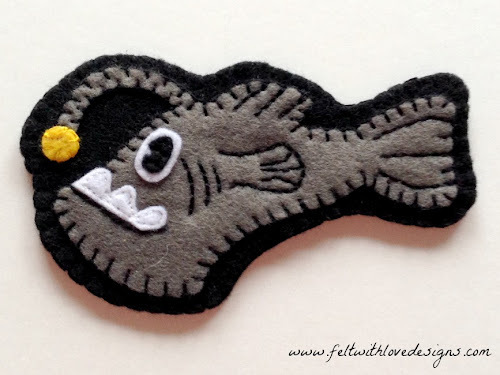 Felt colors: blue, black, and white. 2. Position the black and white eye pieces onto the blue front eye piece and stitch them down using black thread (same as with the squid). 3. Stitch the blue opposite eye to the front white body piece. 4. 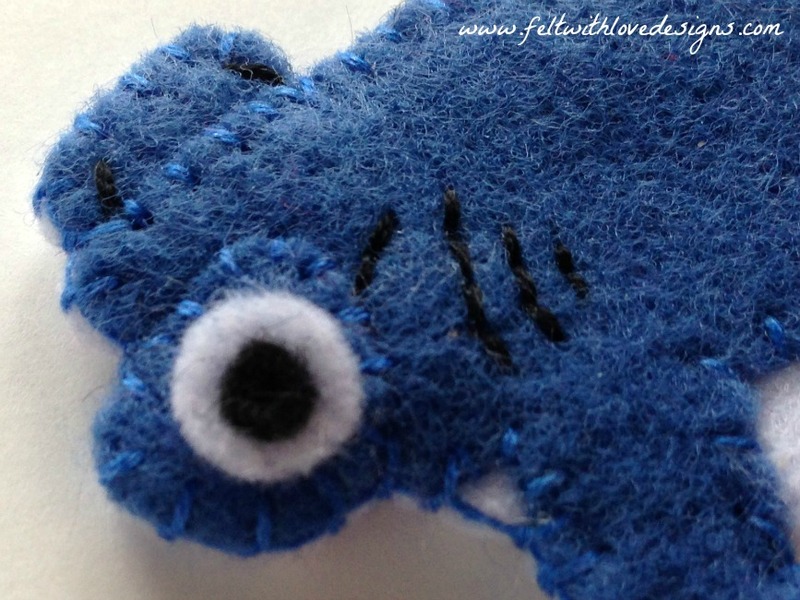 Line up the blue top piece with fins on the front white body piece and pin it in place. 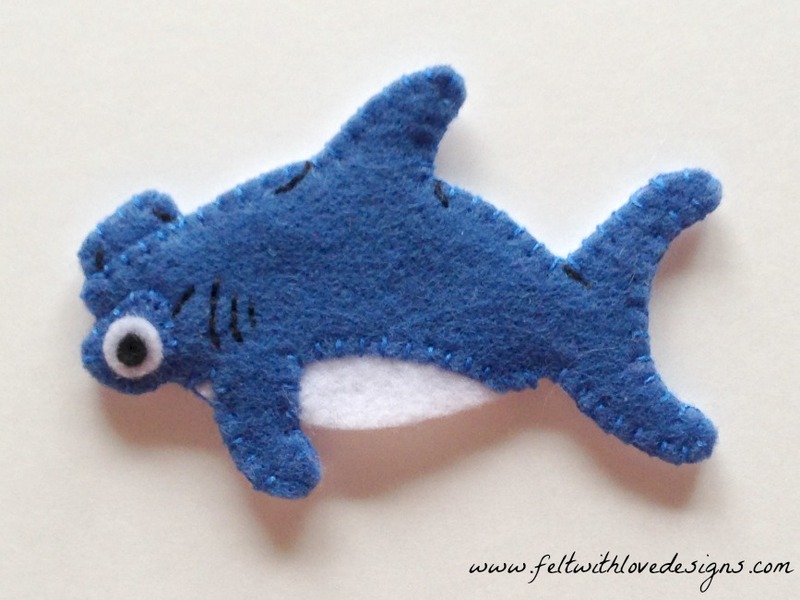 Stitch along the bottom of the blue piece where it meets the white to create the shark's belly. 5. Line up the front eye piece and stitch it in place. 6. Using black thread, stitch lines on the eye pieces, gills, and lines where fins meet body. 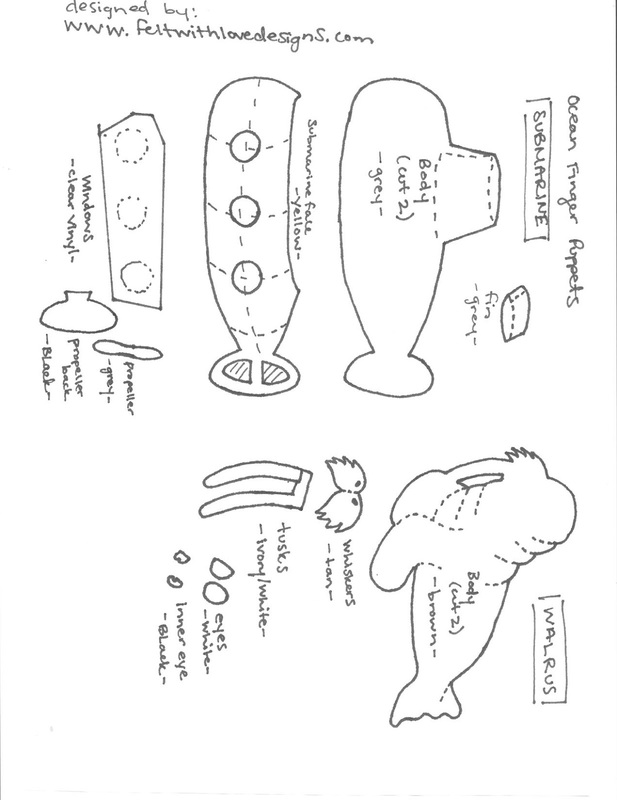 I stitched these free-hand but have included lines on the pattern pieces so you can trace them if you want. 7. Match up the shark body front and back and stitch them together using a blanket stitch, leaving the bottom open. I also go back and stitch just the front edge of the opening with a blanket stitch to reinforce it but that is totally optional. 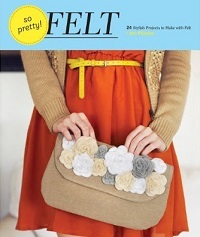 Felt colors: dark brown, light brown, ivory, back, and white. 2. 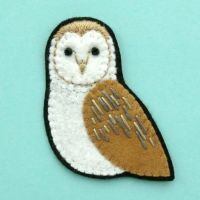 Position the black and white eyes onto the brown front body piece and stitch them down using black thread (same as with the squid). 3. 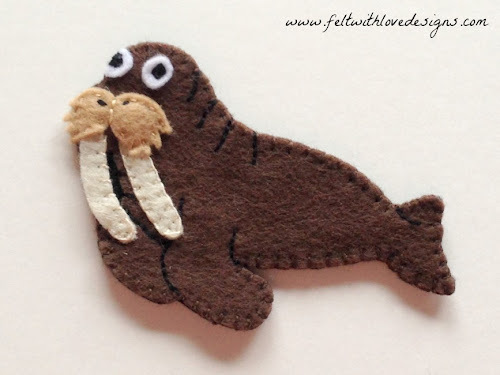 Using black thread, stitch wrinkles and flippers on the brown front body piece. 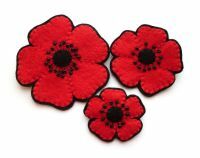 I stitched these free-hand but I've included the lines on the pattern pieces so you can trace them if you want. 4. Line up the ivory tusks and stitch them in place. 5. 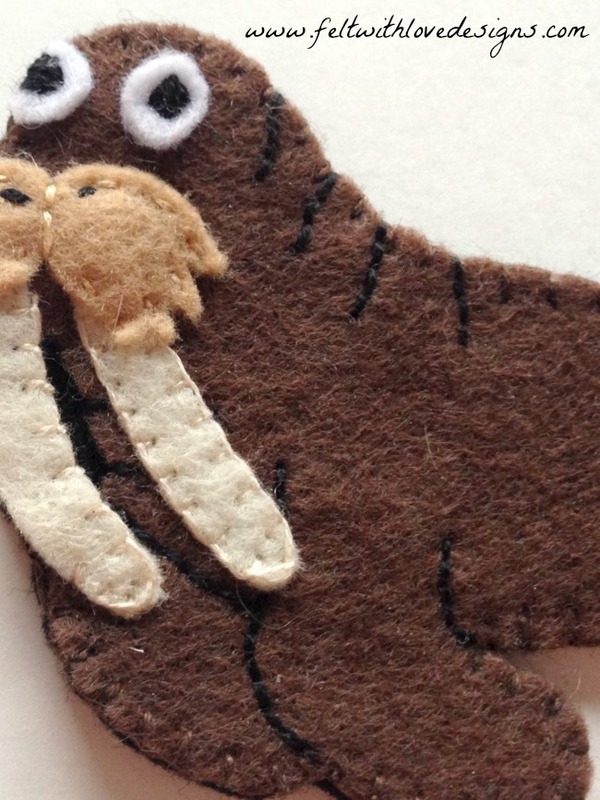 Line up the light brown whiskers over the tusks and stitch them in place. 6. Using black thread, stitch nostrils onto the whiskers. 7. 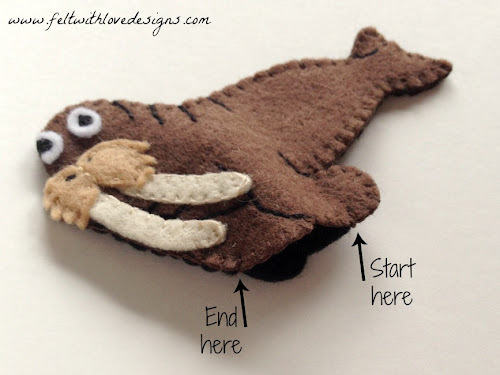 Match up the walrus body front and back and stitch them together using a blanket stitch, leaving the bottom open. I also go back and stitch just the front edge of the opening with a blanket stitch to reinforce it but that is totally optional. 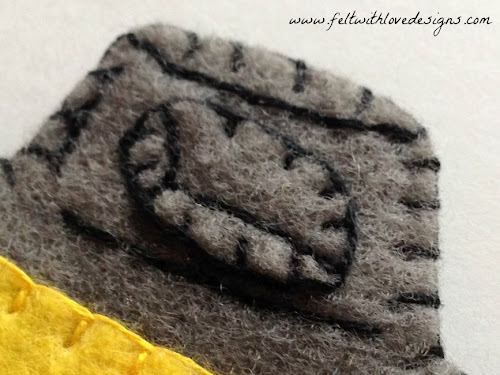 Felt colors: dark grey, golden yellow, back, and white. 2. Position the black and white eyes on the brown front body piece and stitch them down using black thread (same as with the squid). 3. Position the grey body piece inside the front black piece and stitch it down. 4. 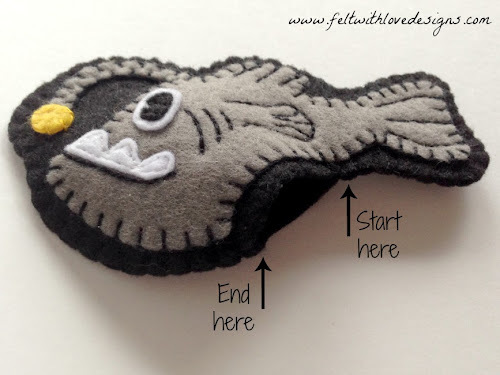 Using black thread, stitch the mouth, gills, and fins on the grey body piece. 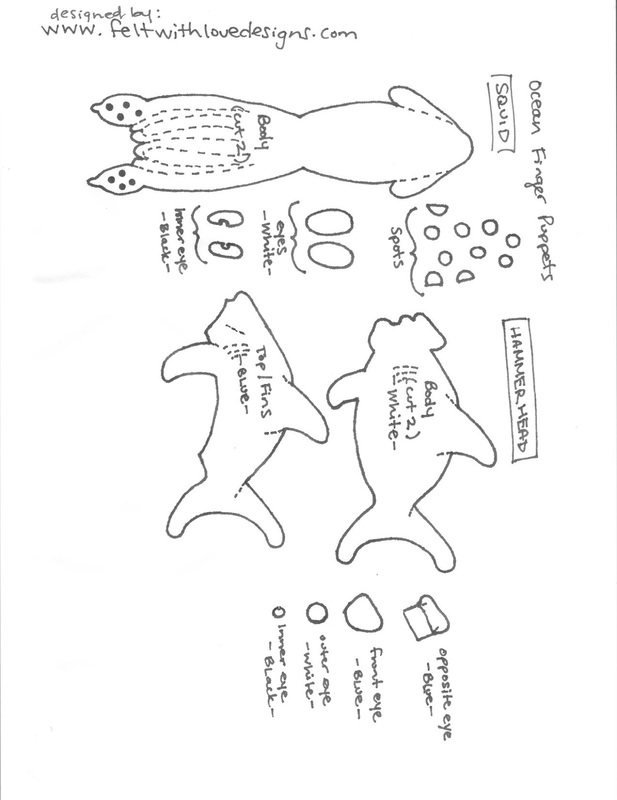 I stitched these free-hand but I've included the lines on the pattern pieces so you can trace them if you want. 5. Line up the yellow ball and stitch it in place. 6. Line up the white teeth with the stitched black line of mouth and stitch it in place. 7. 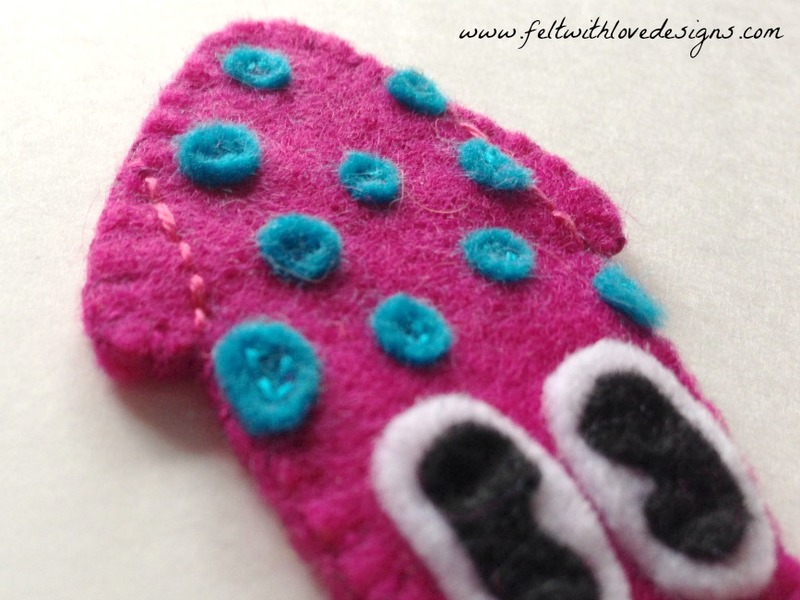 Match up the black front and back and stitch them together using a blanket stitch, leaving the bottom open. I also go back and stitch just the front edge of the opening with a blanket stitch to reinforce it but that is totally optional. 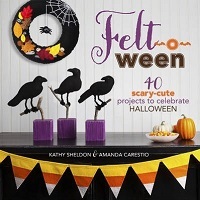 Felt colors: dark grey, yellow, back, and a piece of clear vinyl. 1. Cut all the pieces from felt and cut the vinyl piece. 2. 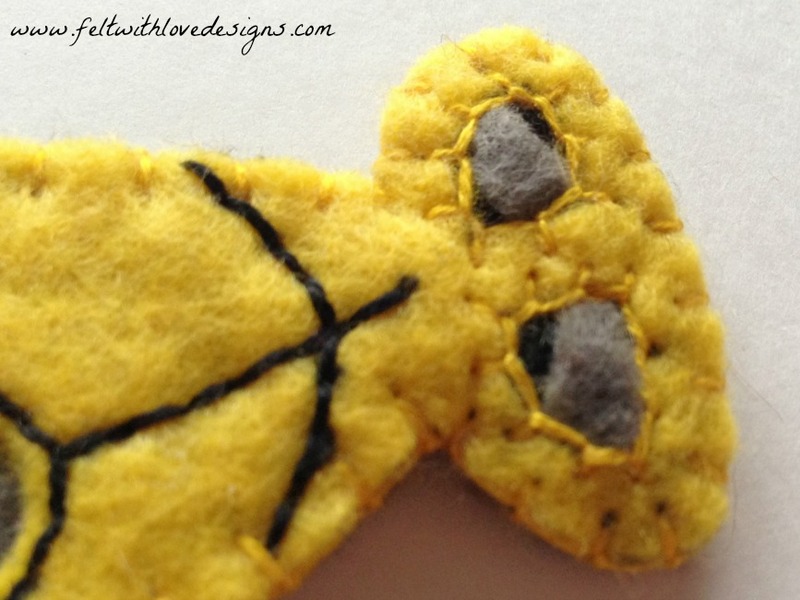 Position the black propeller background and sew it down. 3. Position the grey propeller piece and tack it down in center of the black propeller piece. 4. Line up the clear vinyl and yellow front piece on the dark gray front piece, then pin them in place. 5. 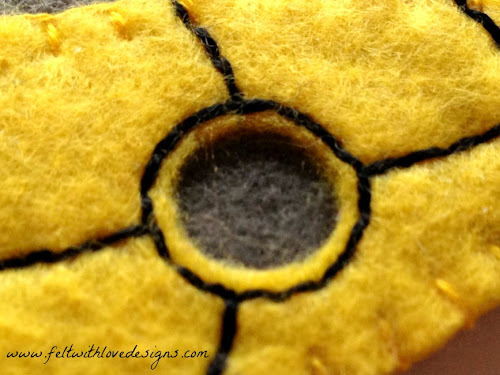 Using black thread, stitch around the cut-outs in yellow front piece to create a circular outline for the windows. 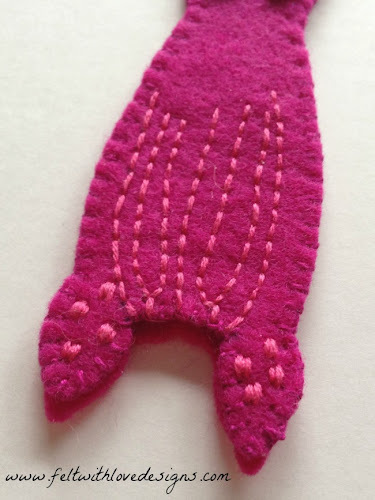 I stitched this free-hand but I've included the lines on the pattern pieces so you can trace them if you want. 6. Stitch horizontal and vertical lines on the yellow portion, connecting the windows. 7. Using yellow thread, stitch down the yellow front piece, covering the propeller so only a bit shows through the hole. 8. Position the top fin and stitch it in place. 9. 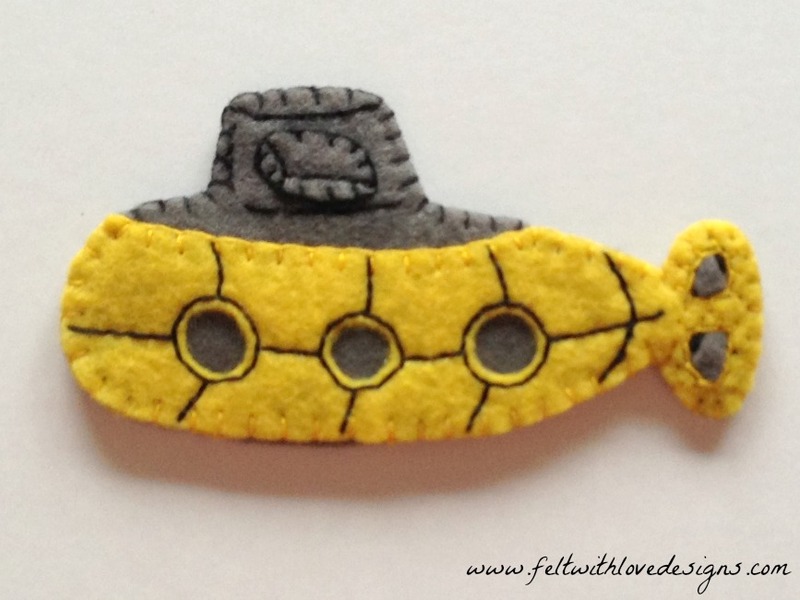 Using black thread, stitch dimensional lines on the top of the submarine. 10. Match up the grey/yellow front and the grey back and stitch them together using a blanket stitch, leaving bottom open. I also go back and stitch just the front edge of the opening with a blanket stitch to reinforce it but that is totally optional. We had a wonderful time designing and creating this set of finger puppets. 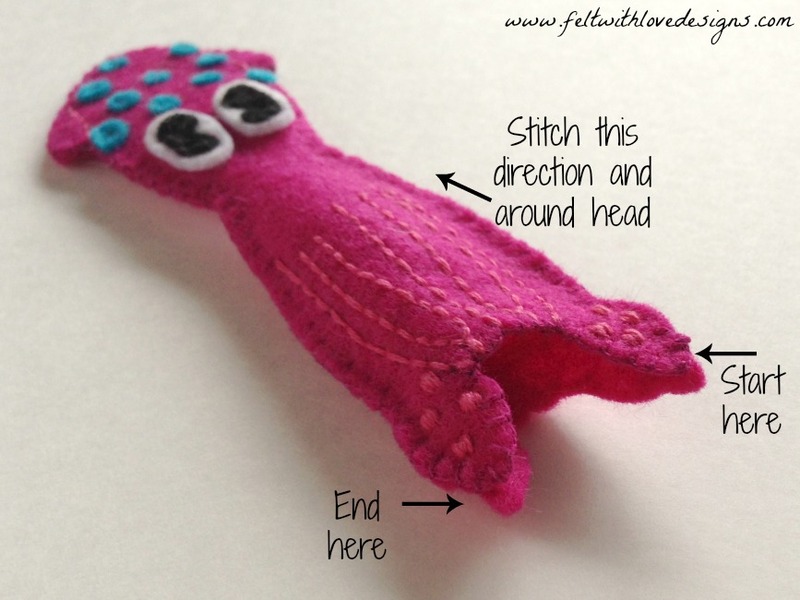 We hope you are inspired to create some fun finger puppets of your own with our free pattern! 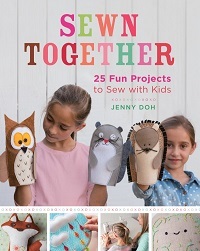 If you do sew some, please share them with us! 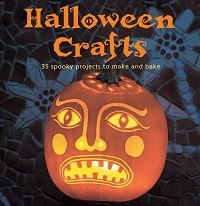 We would love to see your finished work and display them in our reader gallery. Click on the pattern sheets to view them in another tab or window, make sure you're viewing them at full size and then print. 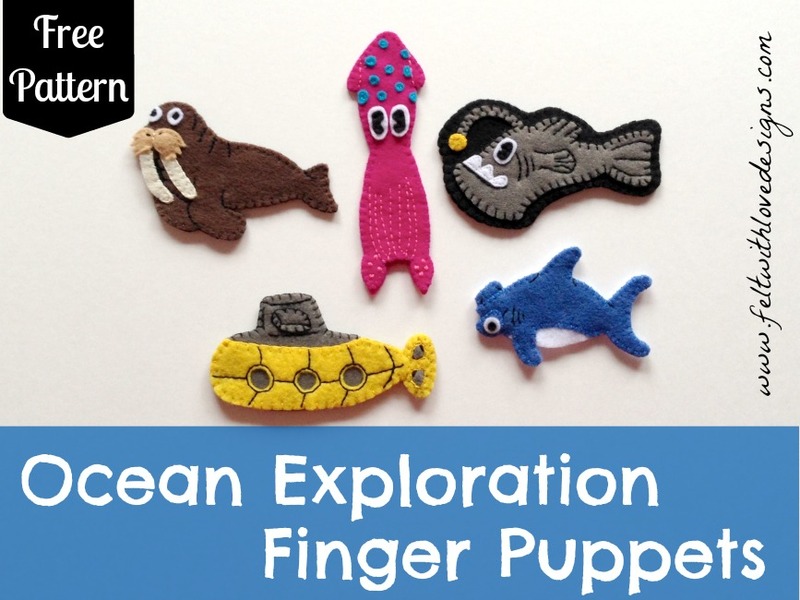 Don't forget to stop by Felt With Love Designs to download the corresponding set of ocean finger puppets too! We also enjoy custom requests! 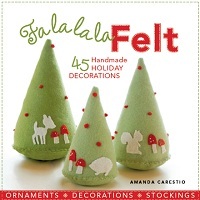 Alicia and her husband, Patrick specialize in felt creations and write about their endeavors at Felt With Love Designs. Patrick is the artist behind the designs. Alicia creates patterns from his sketches and brings them to life with a needle and thread. 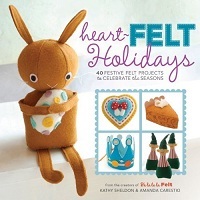 In addition to felt, they are passionate about family, creative writing, crafts, drawing, reading, sewing, and education. 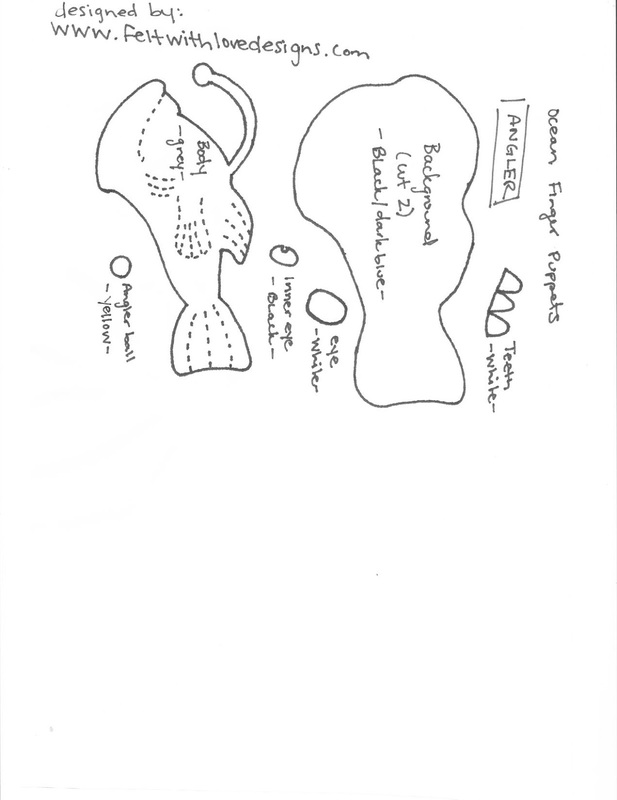 Patrick enjoys sketching coloring pages for their three-year-old daughter and shares those along with his creative writing. 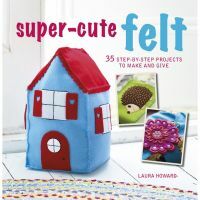 When she's not working on the latest felt projects, Alicia also enjoys writing about their favorite children's books (she's a sucker for a great picture book! 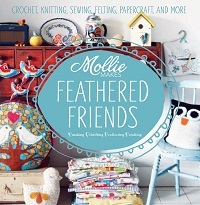 ), her latest sewing projects, and her journey teaching their youngest at home. 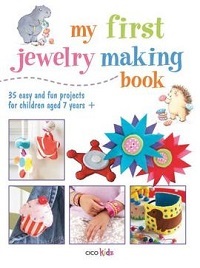 These are wonderful and I know some little people that will love playing with them. I'm off to visit the site you mentioned. 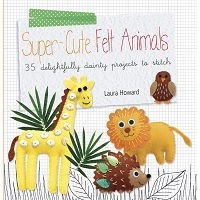 I'm popping over to get the pattern for these cute little creatures. They are adorable! Thanks so much for sharing. 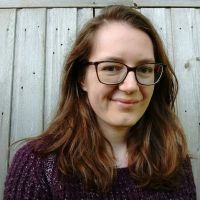 It's a pleasure to visit your blog and I look forward to visiting more. Have a beautiful day! These are so cute! 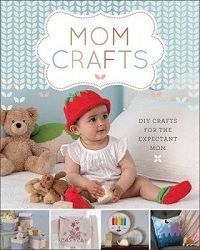 I am going to make for my little one. Thank you for sharing these! 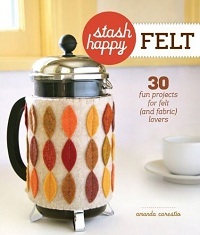 Made in Felt... issue 2! 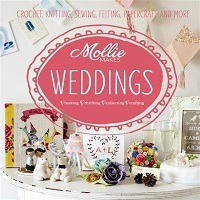 Crafty Things to do when the Football is on! 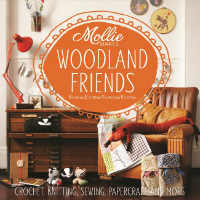 Come for a Crafty Cuppa!